EUR is acting stronger against USD. Industrial Production YoY and MoM is being released in Eurozone along with Fed Yellen Testimony Before Congress in the US. 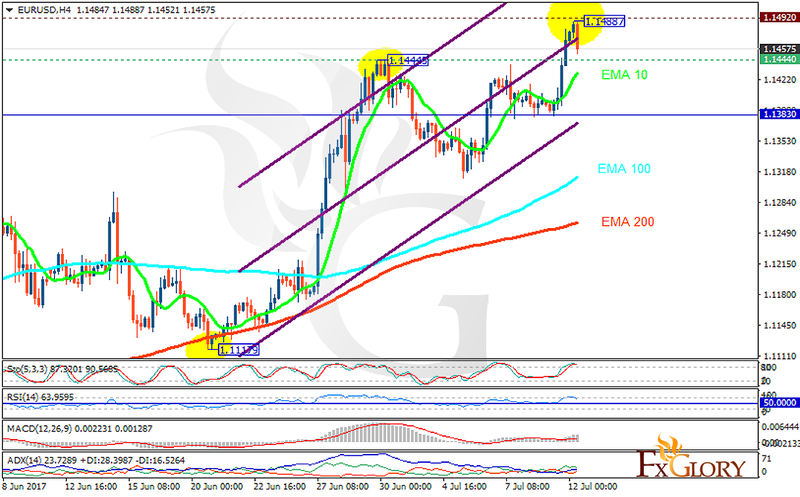 The support rests at 1.14440 with resistance at 1.14920 which both lines are above the weekly pivot point at 1.13830. The EMA of 10 is moving with bullish bias along the ascendant channel and it is above the EMA of 200 and the EMA of 100. The RSI is falling towards the 50 level, the Stochastic is moving in high ranges and the MACD indicator is in positive territory. The ADX is showing buy signals. Long positions are recommended targeting 1.15.